In March, wet days are broken up by the first warm and sunny days of spring, and the island starts to awaken from its long winter slumber and prepare for the beginning of the tourist season, traditionally with the arrival of the Easter holiday. The scent of mimosa flowers and orange blossoms waft through the air, and colorful spring foliage covers the hillsides. March comes in like a lion and goes out like a lamb, so at the beginning of the month, there may be rainy days mixed with afternoons of sunshine. Temperatures tend to be cool, especially in the evening, and the sea water temperatures are still too low to comfortably swim. Dress in layers, with long pants and rain-proof jackets. During the week leading up to Easter, you can see the traditional religious processions on the Sorrento peninsula on Holy Thursday and Good Friday. If you are planning to visit during the Easter holidays, try to book a hotel located in the center of one of the peninsula towns with a balcony overlooking Corso Italia for the best procession views! Processions pass through Sorrento, Sant'Agnello, Piano di Sorrento, and Meta on Holy Thursday and Good Friday. Prepare for heavy traffic: on Easter Sunday and the following Monday, traffic on the Amalfi Coast and the Sorrentine Peninsula is very heavy and it may be hard to get from place to place by car. 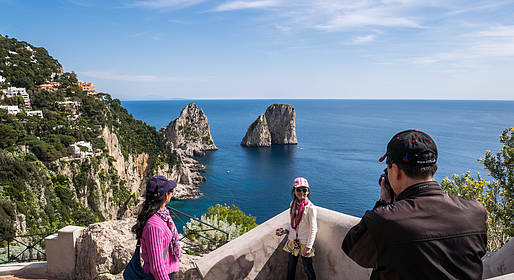 March is the month during which much of the pre-season maintenance work is done on hotels and restaurants on Capri, so you will see builders and painters everywhere and very few businesses are open for the season.